At the 2018 TCT Show, Materialise introduced a new simulation software for metal 3D printing, making it possible to simulate metal additive manufacturing (AM) technology for production purposes. The solution is indicative of both a trend in AM simulation and the growing maturity of the metal 3D printing industry overall. Metal 3D printing, and powder bed fusion in particular, is a notoriously ornery process, with many variables that must be accounted for in order to create a quality, reproducible part. The physics behind an energy beam hitting a bed of metal powder within a gas chamber as the part builds up layer by layer are difficult to anticipate. To successfully produce a part, anchors, support structures and orientation all play a crucial role. Oftentimes, it is only after a handful of test prints are made—resulting in cracks, warping or other defects—that a decent part can be produced. Materialise points out that the actual printing process represents 75 percent of the total cost, meaning the cost of test prints and failed parts can add up quickly. The company also notes that 15 percent of metal parts fail. For this reason, metal AM simulation is key to advancing the state of the technology. The simulation module, available as a part of Materialise Magics, is meant to avoid these issues by optimizing the production process. Support generation and part orientation can be simulated within Materialise Magics before printing to ensure the best possible outcome. An integrated calibration feature also helps users determine the correct simulation settings for a given machine. The company notes that a high-end processor is not required to use the module and that it can be deployed alongside other computer-aided engineering software. Materialise is not the only company that has introduced metal 3D printing simulation software. 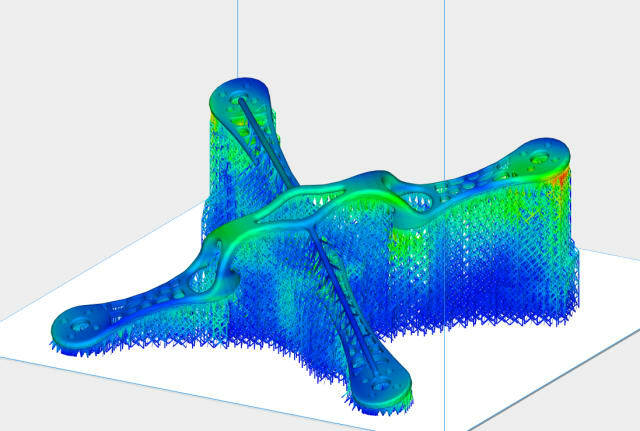 In fact, this particular niche within the industry has become quite active recently as ANSYS acquired 3DSIM to develop its own metal 3D printing simulation platform. Velo3D also created its own simulation software for use specifically with Velo3D systems, resulting in the ability to create metal AM parts with virtually no supports or post-processing. The Materialise Magics Simulation module is based on an original equipment manufacturer (OEM) version of the Simufact Additive Solver from MSC Software. While Simufact is a powerful tool for simulating the metal 3D printing process, tying it to Materialise’s larger Magics suite has important implications for users. Materialise has already been working with 3D printer OEMs for 25 years, developing tools for moving from file to print on a variety of machines. Arguably, there is no third party with more knowledge of such a wide variety of printing processes as Materialise. The simulation module should, then, work well with any system that the company already understands. Additionally, any business already using other products in the Magics suite will be able to take advantage of the module within the larger ecosystem that it is already accustomed to. The addition of Materialise to the list of players in metal AM simulation, along with the growth of MSC’s role in the industry, suggests that metal 3D printing is starting to reach maturity. Once users are able to take advantage of metal AM without worrying about the traditional costly hassles associated with the technology, we will be able to admit that metal 3D printing is, in fact, ready for the manufacturing floor. To learn more about Materialise Magics Simulation, visit the product page.